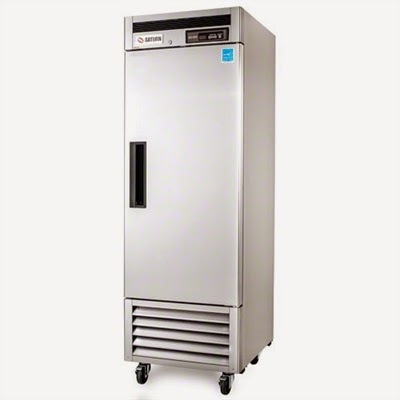 Saturn reach-in freezers represent outstanding value for busy commercial kitchens. They are constructed from the highest quality materials and will last for many years. Commercial reach-in freezers ensure long product shelf life and food safety. And Saturn is known throughout the industry for high-quality freezers, with durable hinges, great temperature recovery times, and tough, damage-resistant interiors. MPM FoodEquipment Group has the Saturn S23F one-door bottom-mount freezer and the Saturn S49F two-door reach-in freezer for sale. The Saturn S23F and the Saturn S49F are in stock in the MPM warehouse, ready to be shipped when ordered. And the savings on these two items are outstanding. The S23F lists for $7,109.00, but MPM has that unit on sale for $2,559.00. That is a $4,550 savings. 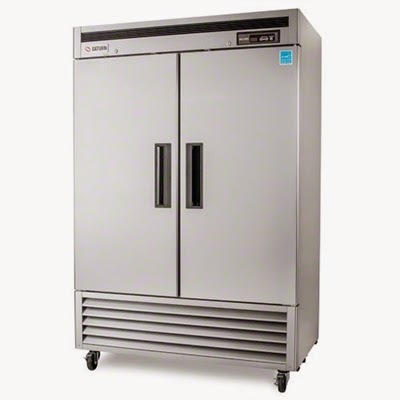 If you need more freezer capacity for your kitchen, MPM is selling the S49F for $3,630.00; that unit has a list price of $10,085.00. Whether you are replacing your old reach-in or are building your commercial kitchen from scratch, you are not going to be able to beat these prices anywhere. These units are bottom mount (the condensers are on the bottom instead of on top of the units), which provide great flexibility for those commissaries or professional kitchens where, above the units, overhead space is at a premium. Bottom mounts assure adequate ventilation to exhaust the systems’ heat. These freezers can handle the wear and tear of a busy commercial kitchen. The doors, sides, and interiors are made from tough stainless steel. And these units will help you incorporate environmentally sustainable best practices that cut expenses on unnecessary waste and increase profitability – the insulation is CFC-free polyurethane, the refrigerant is ozone friendly R-134a, and the units are Energy Star-rated. These Saturn units are made for any foodservice or institutional application demanding efficiency and performance, important considerations in any environment. The reach-in freezers deliver a cool space is crucial for keeping foods safe, and state-of-the-art technology ensures that the units run efficiently. They deliver great performance in higher temperature environments. The Saturns maintain correct temperatures, giving you longer food product shelf life and profit savings. And they have plenty of usable interior space, creating the airflow allowing these appliances to quickly recover after the doors are opened. It is important when looking for reach-in freezers to get energy-efficient models such as these Saturns. The Saturn S23F and the Saturn S49F are built with high-density CFC free polyurethane foam, which permits the units to operate on less horsepower to save you money over time. These Energy Star-rated reach-in units provide high efficiency compressors and fan motors and can reduce energy consumption by as much as 35 percent. Some utilities also offer rebates toward the purchase of qualified products. These are premium units that feature stainless steel construction both inside and out. They come with exclusive extended-usage door gaskets for easier maintenance. Top-notch engineering and user-friendly designs make these reach-ins some of the best investments you can make for your commercial kitchen, especially if you have an establishment with limited space. The designs facilitate easier loading of pans and trays, and over the long term can help minimize service costs. And great units like these can last from 15 to 30 years. And, MPM has the Saturn SCB24-HD and Saturn SCB36-HD charbroilers on sale as well. For the best deal you can find on reach-in freezers for your restaurant or professional kitchen, call MPM today at 1-800-976-6762, or email us. MPM Food Equipment Group stands behind all of the equipment we sell, and we offer the best service in the industry.